Coupons are a great way to save a lot of money on your grocery bill, but they can be hard to keep up with. Clipping, sorting, and organizing coupons takes time — time that you might not feel you have right now. Well, don’t despair! I have a very simple tip for you today to help be able to use coupons even if you don’t want to mess with buying the newspaper, clipping the coupons, and keeping them all organized. Enter, the coupon database. 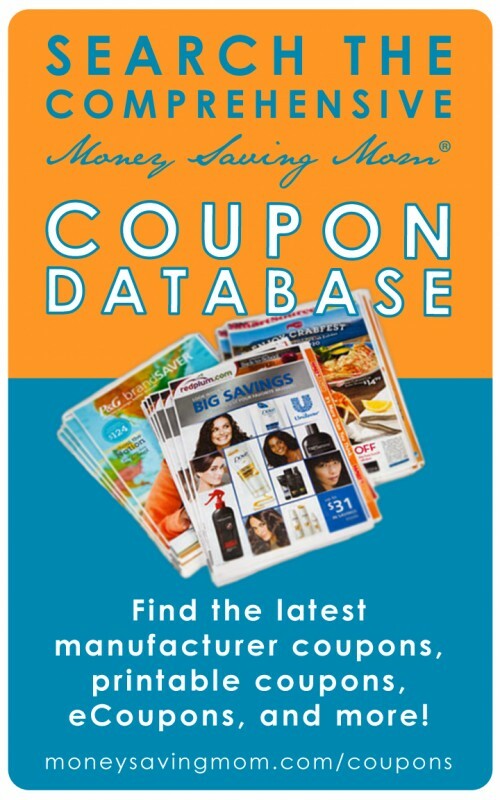 This is a database of all printable and other coupons currently available. You can access the coupon database at the top of this blog under the “Coupons” header. You can search for any brand name or item name. For instance, you can search for bread and it will pull up all bread coupons available. Or, you can search for a specific brand name, such as “Nature’s Own bread” and will only pull up the coupons available for Nature’s Own bread (if there are any available). The coupon database is one of the most effective and efficient ways to save money on groceries. Just plan your menu and grocery list and then, before heading to the store, search the coupon database for items you’re already planning to buy. In less than 10 minutes, you can print coupons for what you were already going to buy and easily save at least $5 for 10 minutes’ of effort (or less!). If you have time, also check the deals at your local stores on your favorite local blog site. These two things can take you less than 15 minutes total and can save you at least $10 per week on your grocery bill. That’s the equivalent of saving $40 per hour — and it’s tax free money! Even if you don’t have time to spend on extensive couponing, you can still save money by using coupons. Best of all, when you print coupons for things you were already planning to buy, you know that your time was well spent since you’re not chasing down deals on things you may not end up using! Do you have any time-saving tips for effectively using coupons? i do this when i remember, & it does add up! I use that database all the time, but I had no idea I could search only for printable coupons. Thanks so much for pointing out something that is probably totally obvious to everyone else! This is a great suggestion. I use a local blog to plan my shopping list, scout the sales, match coupons, etc. Then anything on the list that I don’t have a coupon for I run through the database. It helps! I agree that using a coupon data base is an easy and great way to save money. I do look at coupon and sale match-ups, but when I need an item and plan to purchase it regardless of a sale, I look for a coupon first. This sounds like a great tip, but I have had computer people tell me not to print coupons from the internet since it will mess up my computer. Any tips? Melissa, more than once ‘ve gotten a nasty bad virus that were tracked back to a coupon site as the cause. What I’ve been told by tech support is the viruses are likely coming from popups and not the site itself. I stick to the coupons dot com engine, which is very reputable, and I’m very careful not to click on a popup. I don’t mess with other printable sources. For me, it’s not worth the risk just to save a few cents. Something else that I just learned this month is that Valpak’s website allows you to print coupons as well. Our local nursery advertises in Valpak, and I was able to print coupons for them from the Valpak website. They had a $20 off $60 purchase coupon on their site that I used this morning! That was a really simple thing that took me 2 minutes to find, print, and cut out before I headed out the door at 7 am! Valpak tends to not have coupons for things that I use, but I do use my local nursery, for tomato plants, fruit trees, herbs, etc. I will be checking on there from now on whenever I am planning a trip to the nursery. I love reading these posts. I wanted to share that we now shop at Costco – Costco has sales and you can use coupons. They also sell gas. I can shop every 2 weeks or every 10 days and get all the food I need – I do make most everything from scratch – but buying in bulk saves me a ton! I am making Christmas presents now – homemade jam and the fruit and sugar are such a deal! I have 3 kids and they’re bigger now – we’re a family of 5 and all athletes so we eat a lot – I can’t get away w/the smaller trips anymore, but they’re fun and I still enjoy getting things for free or nearly free at CVS, Shoprite and Walgreens. These inspire me – would you ever have a Costco shopping/saving trip? Ooh, I love Costco, too! Great deals on produce with good quality. Aldi is cheaper sometimes, but ours carries some moldy items. I have to watch. Costco carries things I cannot get anywhere else like Sunrise Energy Bars – which are totally natural and they sell them cheaper than I could probably make them. Or frozen Wild blueberries. Honey is cheaper than Aldi, too. My neighbor was just making apricot jam from the Costco produce deals. I need to get into the habit of doing this. It seems like lately I get the menu made a list made and then fly out the door to grab it all and it is not until I reach the store that I realize, I not only forgot to check for printable manufactures coupons, but also to load my Mperks card, and check the Meijer and CVS flyer, I think I need a printable check list for grocery shopping day! I stopped subscribing to the weekly paper because it got too pricey. Now I just print coupons from sites like coupons.com as I need them. I have a small filing box in which I use envelopes labeled by categories, so that if a great printable coupon comes up but the item isn’t currently on sale, I can file it until I need it (same goes for coupons that come with samples or attached to products if I don’t immediately use them, also for coupons I receive from others). AWESOME!! thank you sooo much! Do you know whether there are such coupon databases for the UK? I go through my sale ads online for three grocery stores and write down the item with the brand name, size and price for each store. (I do this so I can price match at Walmart if I am short on time). I then come here and search the data base….you have to spell the brand names correctly for it to work 🙂 I then go through my other coupons from coupons.com and commonkindness.com. I paperclip them to my list for each store and away I go. added bonus: Sometimes when you go to print the coupon site at a specific brands website, you can sign up for freebies and other coupons as well.